The year 2004 saw the release of a totally new PS2 game from Capcom, which went by the name of Monster Hunter. Since then, eight more games have been released in the main series, as well as a Japan-only MMO and a handful of spin-offs. 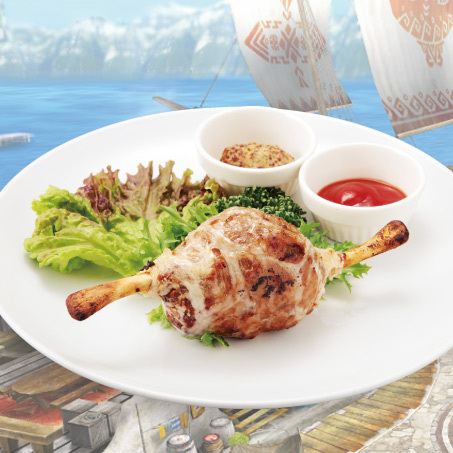 The series is huge over there; the Capcom bar over in Tokyo has some Monster Hunter-themed dishes in its honour, my personal favourite being the green tea-flavoured ice-cream rolled into the shape of Cha-Cha’s head. This would be a good thing to eat first thing in the morning. The latest entry in the series, Monster Hunter 3 Ultimate, will be hitting stores across the Americas today, and will be arriving at European and Australasian stories in a few day’s time. To celebrate its release, the hunters at oprainfall have all gathered to discuss a couple of questions regarding their preferences when they sit down to go hunting. Hopefully, you’ll learn a little about the way we play. So please, read on to hear a little about our Monster Hunter experiences! Where would a hunter be without their trusty weapons? The first thing I asked the staff was which weapons they use, as well as how they got into the series, if they wished to say. Charlotte Buckingham, Co-Editorial Head: I like slow, heavy-hitting weapons; ones where I can feel the power with every punch. As such, I wield the hammer and the great sword primarily. 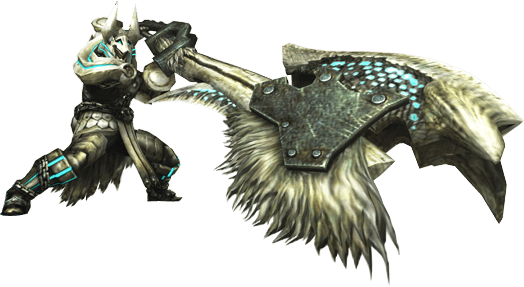 In MH3U, I’m going to look into picking up the hunting horn and the bow. David Rawlings, Editor: Switch-axe – it’s a sword and an axe. It’s the best of both worlds and the feeling of ‘reloading’ makes it feel more of a beast weapon than any other. I also like how one design looks like you’re carrying a giant waffle on your back. Mmmm, waffles. Phil Schipper, Reviewer: I bought Monster Hunter Tri for the Wii on a whim. I had some free money about to expire, and it was one of my only options, so I had nothing to lose. While it was shipping, I asked a few friends about it, and to my horror, they told me that it was heavy on grinding. I don’t mind a little leveling in RPGs, but the way they said it, it was as if grinding was the entire point of the game. I wasn’t so sure I’d like it at that point. I started my way through the story and trudged my way through the boring tutorial missions. For a while, it was just okay, and I didn’t get much into it. Then I got to my first boss battle, the Great Jaggi fight, and everything changed. It was all action, reflexes, and learning my opponent’s every move. If I didn’t get it just right, I’d be punished. That’s when I got hooked. Who cared if I had to grind by fighting some of these battles over and over? The battles were FUN. Every time I did it, I’d get a bit better at it, too. The only problem I had with the game was the time investment. I’m a pretty busy guy, and things come up a lot. The fact that most stages have 50 minutes as a TIME LIMIT tells you why I never got to the end. Though it’ll take me some getting used to the 3DS controls, I’m excited to go on some quick hunts in the future. A hunter who has donned Ceadeus armour and is holding the Great Inceadeus, a powerful water-aligned switch-axe. Jodie Langford, Translator: I am a switch-axe lover. It was the one weapon I found not too fast or slow, and the one weapon I seemed to excel at. The sword mode of the SA managed to satisfy my need for a gutsy blow, especially the burst of energy you got from the charged attack, not to mention the adrenaline in the fight. The switch-axe is a smooth but heavy weapon. It also allows you to make your friends fly. All in all one, of the most fun weapons. With Monster Hunter 3 Ultimate though, I am eager to try out the dual swords and the bow. Lyndon King, Writer: Monster Hunter was a random encounter for me as I remember seeing it all the time at a game rental store, and the guy working there told me the game worked only online. At the time I had no idea how to play the ps2 online, and this was before I really knew about looking for info on games. Becauuse I was told that about the game I never rented it, but a while later I decided to give it a shot and see because I thought, why would there ever be a ps2 game that’s online only? Since that day, I have never regretted playing it and now love the series because it was different to me; it was new and interesting, and the music and look of the game was wonderful. Years down the road I got to play it online and was amazed that I could be in my own room, playing a game on my ps2 with people all over. So in short, my first-time experience with the series was pure random chance and a good guess by myself. For weapons, it ranges depending on which game in the series I’m playing, but overall I’d have to say either the switch-axe or the dual blades. I always loved dual weapons, and, well, the switch axe was like a combination of my favourite weapons; swords and axes. It made me feel like I have full freedom to be either slow and powerful or faster and less powerful, and at any time I choose. Tyler Lubben, Writer: My love affair with Monster Hunter began after a friend told me about Monster Hunter Tri on the Wii. For some reason, hacking oversized monsters to death with weapons as big as you sounded appealing to me, plus, I was sure I’d be better at it than him. When I was initially selecting my weapon of choice, I decided I wanted to go with the slowest, hardest-hitting weapon there was. My reasoning was that it would likely be fairly tricky to learn, but I could probably be a force once I got the hang of it. This is how I got my hands on my first hammer, and I haven’t looked back since. There is something incredibly satisfying about finding that small window of opportunity where you can smash a monster’s head in seconds before it can make you its next meal. 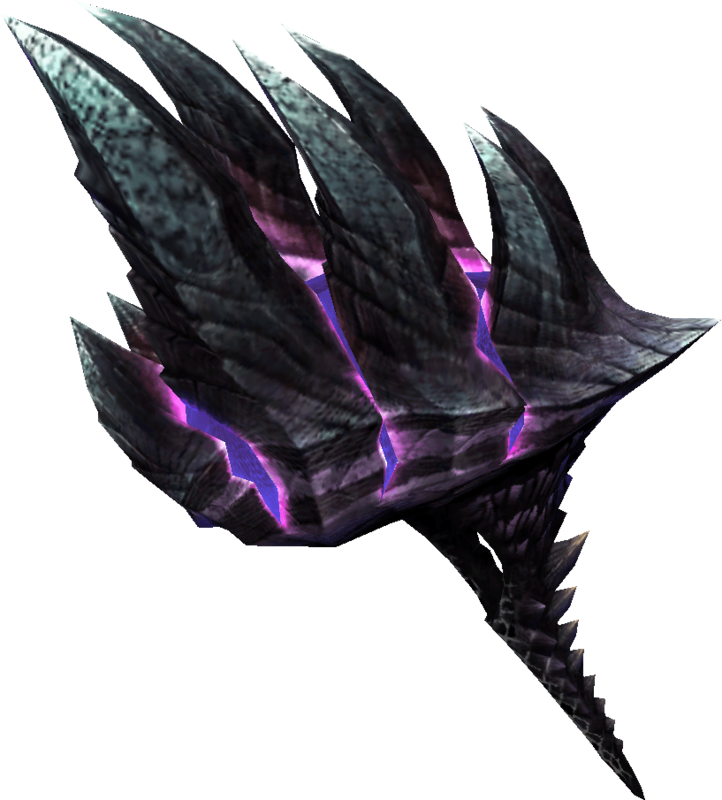 A wicked dragon-aligned hammer made from Alatreon parts; the Tri’s final online boss. Head over the page to hear more about monsters!